I’ve been skateboarding for a long, long time; More than 35 years (and yes, still counting). I’ve been through loads of decks, countless sets of wheels and grinded through my share of trucks. But for some reason – maybe I was nostalgic even as a kid – I always kept my first skateboard and kept it in relatively good condition. 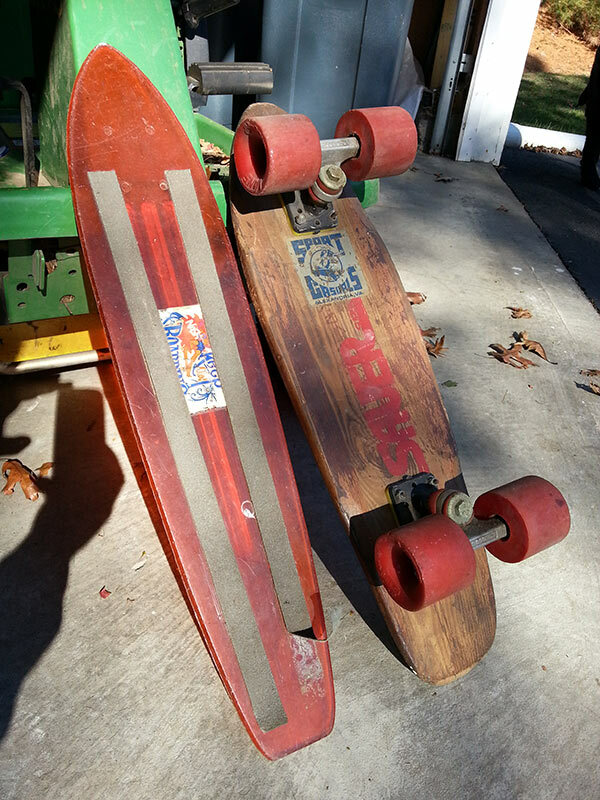 I got my first skateboard on a family trip to see my cousins in Alexandria, VA in the mid 1970s. I loved this board. I bombed a lot of hills on this board. Fortunately for the board when I started doing tricks I had already moved-on to another set-up. Fortunate too, perhaps, for investment because the board may hold some value as a collectors item. Sauer deck (I have no additional information on this brand, let me know if you do! Nash (red transparent) – Deck only, with ‘Keep on Boarding” decal. Lots of people collect vintage skateboards, including my college buddy and former partner in crime Rob Kendall (known as Kookmeyer). Rob has a massive collection of new old stock (NOS) and more recently started Weird Wood Skateboards. If any of you collectors out there know anything about the two boards in the picture I’d like to know. I showed the pics to a Vans rep yesterday and he’s asking folks back at HQ if they’ve ever seen these wheels, he’s never seen Vans wheels so it kind of blew his mind.